The W-12 is a standard-tread version of the F12. It is basically the same as the F12 except for the lower, fixed-tread setup. My father restored a W-12 more than 40 years ago. For 36 years, I have had the tractor in a parade for the annual lawn party. This year it may miss the parade because of a part that is cracked and needs replacing. I am hoping someone can help me find a part. We are trying to fix the cracked one. The best I can describe it is it s the part that the crank fits into. I can send pictures if needed. Thanks! 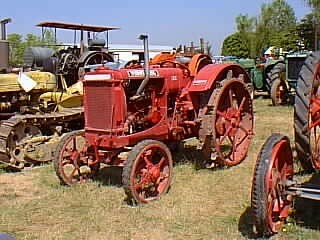 I am looking for a Farmall W-12 tractor. I have a motor and transmission, I need the frame and fenders. If anyone knows of one sitting in the weeds in a back field PLEASE contact me. Thanks. I JUST FOUND A MC CORMICK W12 AND IT IS A VERY FADED GREEN COLOR. WERE ANY W12 TRACTORS PAINTED GREEN.THANKS LYNN S.
I am looking for the drawbar with a pintle hitch for a i-12. Also interested in talking with any one who know about the governor for a i-12 that sets bellow the carb. mary kline would you please ph. me. at 1-780-712-2829 about the w12. pics. would be good. thanks. to Tony Hnatiuk--I just saw your note asking if i still had the McCormick-Deering W 12--yes, i do. I am going to have to sell it, tho. If you have any questions, please email me. hi guys! i would need a starter for my oliver oc3-42, anyone could help me to find it thks in advance !!! I found an American Tractor Equipment Corp tracted, bulldozer type, front loader with Willys engine and drive. Where can I find information and value. I want to buy and restore. I was told it s a 1934. Don t know anything about them; I m a willys jeep man. Help! hit wrong key , e mail is hnatiuk57 at yahoo.com for parts or info. What color is a w-12 red or gray? am looking for carburator for 1944 International Harvester or McCormick Deering. Any help? I am looking for a McCormick Deering W-12 to restore. We sold one back in the 60's and would like to repalce it if possible. I am restoring a W-12,I would like to know the original color.My tractor is a 1935 according to the ser#,is it red or gray if so do you know a paint code? I am looking for a set (front and back ) of steel wheels for my W-12. Mine has cut-offs with new rubber on front and 75% (in good shape)rubber on the back. Will consider these as part of trade/price if interested. I have a very nice McCormick W6 - Runs perfect and looks great for $2,500 if anyone is interested. I have a International Harvester W-14 serial number WS4667. I wonder how many trctors that was built of the W-14 modell. If anyone have a picture or information of this tractor. Please send it to me. I am looking to buy a W-12 at sometime. Anyone out there selling one. I have several tractors of my own but one of my favorites is my Fairway-12 # 838. If you are interested in talking about the Fairway or know of a W-12 that can be purchased please send me a note. The '38 W14 McCormick thats owned me for 27 years, was bought by my grand father either new or near new before the "Big One".I got it when I was 12. He told me if I could make it run I could have it. So it's the first real motor I ever worked on.Still starts on the second pull! We have a 1951 W-4 McCormick-Deering that we are restoring.I would like to paint the logos on but need a picture close enough to see the details. Ours are worn off too bad. Can anyone help? I have a 1934 W-12 and McCormick Deering is casted into the radiator. Mine is the 612th one built. I bought this tractor in Titusville Pa. two years ago, it needed a lot of work but it is worth every penny I have put into it. There isn't hardly any around this area in Michigan. what is a w-12 worth in fair condion ? i am 9 years old and i have a w12 of my own. my dad, grandad and i have recently restored it. i took it to the winchester tractor show, and cause i didn't have a license my mum drove it in the parade for me. For Tex Evans, I have the draw bar for a W-12 and am willing to sell it as it is an extra. I have either a W-12 or a W-14. I think it's a W-14 because it has the aluminum tag on the radiator top tank that says McCormick Deering. I think the W-12's had the cast iron raised letters instead. My serial number tag is gone, and I can't find any matching casting numbers. What year is the one pictured? Does it have the aluminum tag on the radiator? Do you have any extra parts for one of them, such as the drawbar?